A month after an argument between the Vice Captain of the Detention Center, Truong Viet Hung, and political prisoner Tran Hoang Phuc, as well as his family, Phuc’s family was able to visit him and send him some food on April 5, 2019. Phuc shared that the detention center gave him and other political prisoners some additional rights, which Phuc and his family have been continuously petitioning for for more than seven months. They allowed Phuc to receive his own blanket, pens, books, and notebooks and to call his family. Authorities also gave prisoners two more television channels to watch. Before ending the visit with his family, Phuc confirmed that he and others have continued asking for even more rights in prison. Phuc is a law student from Ho Chi Minh City. He is a bright, award-winning student but was prevented from graduating from law school in 2016 due to his activism. Phuc is the founder and President of the Vietnamese Students for Human Rights Association. He is also a member of the Young Southeast Asian Leaders Initiative (YSEALI), a U.S. government leadership development and networking program in Southeast Asia. He was invited to meet with U.S. President Obama in 2016 during Obama’s visit in Vietnam but was blocked by police from attending the meeting. 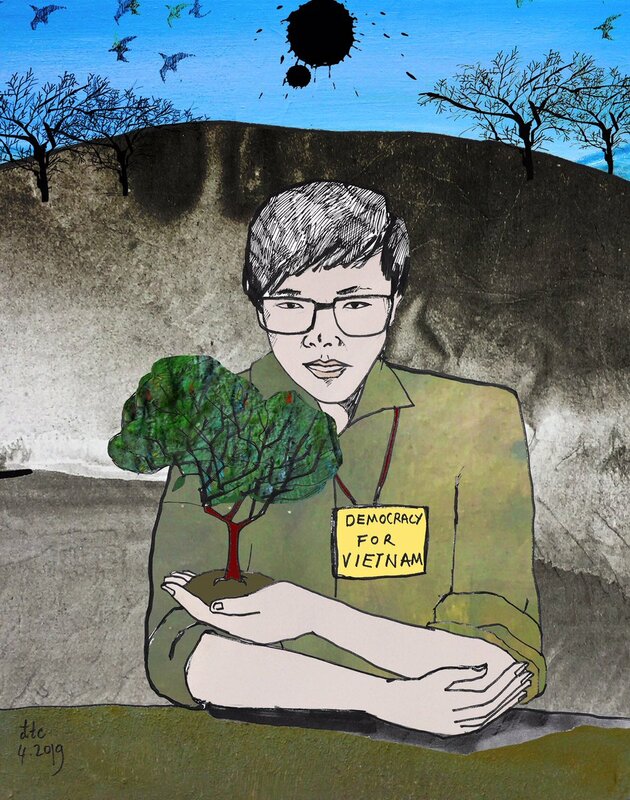 Phuc has participated in environmental rights protests and campaigns to seek compensation for those affected by the 2016 Formosa environmental disaster. Arrested June 29, 2017. Sentenced to 6 years in prison under Art. 88 (1999 Code). Expected Release is June 29, 2023. Tran Hoang Phuc was kidnapped by police in Hanoi from his apartment, on June 29, 2017. Phuc, 23 at the time, was officially charged on July 3, 2017, under Article 88, for Internet postings, particularly for video content. He was tried on January 31, 2018, by the People's Court of Hanoi together with Nguyen Van Dien and Vu Quang Thuan. They were charged under clause 1 of Art. 88 of the 1999 Criminal Code. Phuc received a six year sentence and four years of house arrest. According to the indictment, Vu Quang Thuan and Nguyen Van Dien were accused of posting 17 video clips on the Internet and possessing materials with anti-socialist state content; Tran Hoang Phuc was accused of helping them in storing the materials and posting 3 of the 17 clips. Vu Quang Thuan, Tran Hoang Phuc, and Nguyen Van Dien appealed their January 31, 2018, sentences. Phuc and his co-defendants' appeals were denied. Family members were not allowed to attend the appeal trial, and the court still refused to show the videos in question in the indictment; the videos were also blocked at the first trial in January. Defense lawyer Ha Huy Son said of the move: "This left both the convicted men and their lawyers with no way to debate the prosecutors. In other words, the court issued its ruling without considering the evidence, which is a violation of Vietnamese law." Huynh Thi Ut, Tran Hoang Phuc's mother, wrote a letter to the Office of the United Nations High Commissioner for Human Rights with details about Phuc's conditions in prison and to thank the Office for its support of Phuc's case. Phuc had asked his mother to write the letter, as he was not given supplies in prison to be able to write the letter himself. In the letter, she described difficult day-to-day conditions that had contributed to Phuc losing significant weight since being imprisoned; Phuc's hepatitis C was also not being treated. She added that, "Inmates are allowed to read only Ha Noi Moi newspaper from the city’s Party printed on Monday-Friday. Phuc’s family is not allowed to send him books officially printed by state agencies. Phuc has not been supplied with pens and papers to write letters to his family nor permitted to make calls to his family as others do." Tran Hoang Phuc and his co-defendants, Vu Quang Thuan and Nguyen Van Dien, planned to appeal to the Supreme Court after their sentences were upheld on appeal. On October 5, Tran Hoang Phuc’s family visited him at An Phuoc detention center for the third time. Their meeting was supervised by two officers and recorded. He confirmed that fellow political prisoner Vuong Van Tha was transferred to An Phuoc detention center. He promised to help Mr. Tha and wanted to send him money through his family. Phuc was thin and did not know whether he had been infected with any diseases in prison. To improve his nutrition in prison, he has to grow vegetables on his own. Back in September, Phuc’s letter home to his family was rejected by the Letter Censorship Agency of An Phuoc detention center. The reason given was: “Written content was about how Phuc had lived during the time at No.1 detention center.” However, Phuc argued that the content of the letter was to ask about family’s health, not about what had happened at No.1 detention center. But authorities asked Phuc and his family to talk about health issue and family news without mentioning conditions at No.1 detention center. The issue was referred to supervisors of the prison. On January 5, Tran Hoang Phuc’s family visited him at An Phuoc Detention Center. They said that he was in good health and spirits. However, Phuc revealed to his mom that he has been harassed by other prisoners since his first instance court hearing on January 31, 2018. After being charged, he was transferred from cell 1 to cell 10, where he was held with 14 criminal prisoners and addicts. He asked his mom to record their conversation, in case An Phuoc Detention Center edited it to slander Phuc for “revealing national secrets and affecting national security." Tran Hoang Phuc was worried that soup provided in prison may have been poisoned and was only eating food provided by his family, according to his mother. Phuc was able to receive medication from his family for his hepatitis C in January. On March 5, 2019, Tran Hoang Phuc’s mother visited him at An Phuoc Detention Center. Phuc told her that fellow political prisoner Vuong Van Tha, since February 2, 2019, had refused food from the detention center and only eaten food from his colleagues or that he himself has grown. He asked the detention center to exchange his meat ration for money he can spend on vegetarian food; after five days, the center agreed. In addition, Phuc had also continued refusing food from the detention center and for two months has only eaten food sent by his family. On March 5, he sent a letter to Board of Detention Supervisor to ask for some benefits for prisoners, including more television channels, more newspapers, and time to play sports outside on the weekends. At the end of their visit, Phung Van Tuyen, a detention officer, asked to meet with Phuc’s family and debate his letter's requests; he promised to answer Phuc's requests soon. On April 13, 2017, Phuc and activist Huynh Thanh Phat were attacked and left in a rural location by plainclothes assailants. Their case is one of many highlighted in Human Rights Watch's "No Country for Human Rights Activists" June 2017 report on attacks on activists in Vietnam. Five Vietnamese lawyers appealed to the government to improve medical treatment for Tran Hoang Phuc. Phuc is suffering from hepatitis C while imprisoned and has not been able to receive medication from his family, despite having a prescription from an independent facility. Supporters feared that Tran Hoang Phuc was facing unsafe prison conditions at An Phuoc prison camp in Binh Duong province. He asked his mother for items for "detoxification" at a visit on August 16, and she reported that his behavior had been strange recently. The prison camp is notorious for its poor health conditions, which some have implicated in the deaths of prisoners after their release. Many prisoners across Vietnam have complained of tainted food and dirty conditions conducive to the spread of disease. Amnesty International condemned the original sentences of Phuc and his co-defendants and called for their dismissal ahead of the appeal trial, with their Senior Director of Global Operations Minar Pimple saying: "These three men have committed no crime; they have merely used social media to express opinions that the authorities do not like – namely by supporting the protection of human rights and social justice in the country." The US Embassy in Vietnam released a statement following the appeal trial expressing disappointment in the outcome.